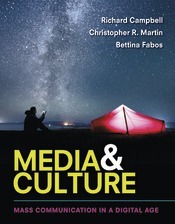 LaunchPad for Media & Culture, Eleventh Edition meets students where they love to be – online. Brand new interactive timeline feature will help students dive into the history of mass communication and see how one event or advancement led to the next. The Extended Case Study has gone digital as a new assignable and assessable online activity. Focused and streamlined to keep the rich coverage while helping students access the most important information. Sleek new modern design keeps students engaged with the great content provided in the text. Brand new boxed features covering positive effects in digital gaming, race struggles in Hollywood, tough new laws on tobacco advertising, Super Bowl ad spending, and black ownership of U.S. television stations, among others. Cutting edge examples including Adele, Star Wars: The Force Awakens, #OscarsSoWhite, Spotlight, and many, many more. o An all-new Extended Case Study corporate responsibility during a crisis.